OAKLAND – The Alameda County Board of Supervisors moved forward a consensus redistricting map Tuesday with hopes of placating a few communities angered by the possibility of a split among different supervisors. 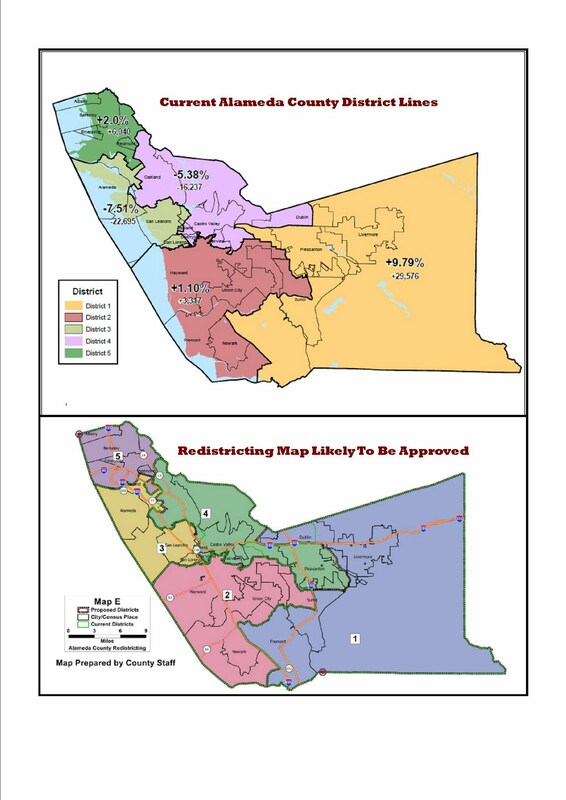 Under the favored redistricting proposal, known as Map E, residents in Hayward, Pleasanton and Dublin would remain intact under a single supervisorial representative. The biggest change in map is a city-wide trade of supervisors for Dublin and Pleasanton. The board is scheduled to formally approve the new district lines during its July 12 meeting. A four-fifths majority is needed for passage. The role of the voter approved proposition to more fairly redraw the legistlative boundaries of the state sought to clean up the so-called “squiggly lines” peculiarly rendered by lawmakers gerrymandering district for their own political advantage. The mechanism of citizen drawing the lines in Alameda County, though, is still in the hands of those in power. The proposal, created by county staff, would move District 1 Supervisor Scott Haggerty’s Pleasanton headquarters to Supervisor Nate Miley in District 4. The rapidly-growing Dublin would move from Miley to Haggerty. Board President Miley’s district would snake from a third of Oakland through Castro Valley and large swaths of the county unincorporated areas to Pleasanton. Haggerty said he laments the possibility of losing one of the Tri-Valley cities. “It’s going to be really tough to give up Pleasanton,” adding former county supervisor Ed Campbell, who Haggerty replaced, would “roll over in his grave” knowing Pleasanton would no longer be part of District 1. Haggerty’s may also lose his district office located at the Alameda County Fairgrounds if the map is approved. Pleasanton Councilwoman Cheryl Cook-Kallio issued no protest to any of the five remaining redistricting maps, although she said her city would prefer to remain under Haggerty’s representation. Pleasanton did not submit an alternate proposal, she said, for fear it would adversely affect its Tri-Valley neighbors and the region. The initial Map A submitted by county staff drew criticism officials and residents in Pleasanton who opposed splitting the city miles south of its current boundary running along the 580 freeway. “I guess I didn’t know the firestorm it would bring,” Haggerty said with a slight chuckle. Subsequent maps submitted by a non-partisan citizens’ group named the Alameda County Redistricting Task Force knitted Dublin and Pleasanton back together, but aimed to divide Hayward, instead. Hayward Councilman Marvin Peixoto advocated for the county’s Map A, but told The Citizen before speaking Tuesday the Map E would also suit his city and its growing Latino population. Peixoto said Hayward’s District 2 has a long history of electing Latino leaders to the Board of Supervisors starting with former supervisor Charlie Santana and leading to current board member Supervisor Nadia Lockyer. “I think this is important to Hayward, but also adjoining it to the cities of Newark and Union City who also have large Hispanic populations,” said Peixoto. According to the latest U.S. Census, Hayward’s Latino population is now the city’s largest demographic at over 40 percent. Under the board’s preferred map, District 2 would encompass over 95,000 residents of Latino descent, easily the largest concentration of that particular demographic in the county. Conversely, Lockyer’s District 2 would also be the least white of any region by a large margin, according to the county. The proposal also maintains the roughly three-part partition of Oakland represented by Supervisors Keith Carson, Wima Chan and Miley. This is important since each slice of the county seat by themselves make up three of largest areas in all of Alameda County along with a significant power base and infiinte fundrasingn capabilities. Haggerty’s chunk of three-fourths of Fremont with over 165,000 residents would be the largest city or portion of a city within one district. Posted in Alameda County Board, Cheryl Cook-Kallio, Dublin, Fremont, Hayward, latinos, Nate Miley, Oakland, Pleasanton, redistricting, Scott Haggerty, Tri Valley, Wilma Chan. Bookmark the permalink. Too bad for Haggerty. I bet he felt at home at the fair next to the horse stables. I bet they find a poster of Ronald Reagan under the wallpaper in his office.